Business meets football: The new “Executive Lounge” at the sky box level in Munich’s Allianz Arena, offers its guests the most up-to-date business interiors, all-day concierge service, and upscale catering in a modern ambience. The idea for this design, still unique in Germany, originated with Arena One, the Allianz Arena Munich’s exclusive hospitality partner. The Executive Lounge is equipped with laptop desks and wireless LAN. This new location serves as the welcome area for skybox and event guests of the Allianz Arena. Just as in a classic convention hotel, a concierge stands ready to provide professional services to skybox visitors. The concierge services range from guiding guests to the event-box to copying and printing seminar documents. 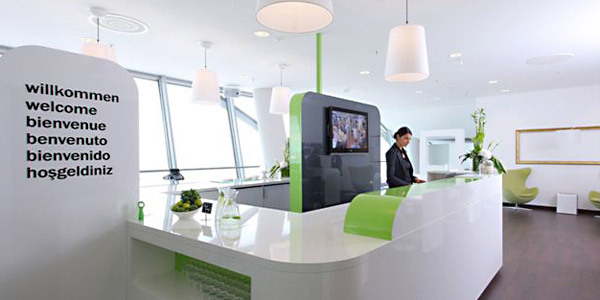 On request, the concierge can – on short notice – organise a tour of the most modern football stadium in Germany. Arena One takes care to ensure the premises in the Allianz Arena, such as the skyboxes and VIP area, are also put to use on non-match days. Before, during, or after a trade fair, convention, or seminar, participants of box-events can continue their business talks in the Executive Lounge. There, they can make use of the fully equipped business area or have breakfast, lunch, or a take a coffee break in a relaxing atmosphere.